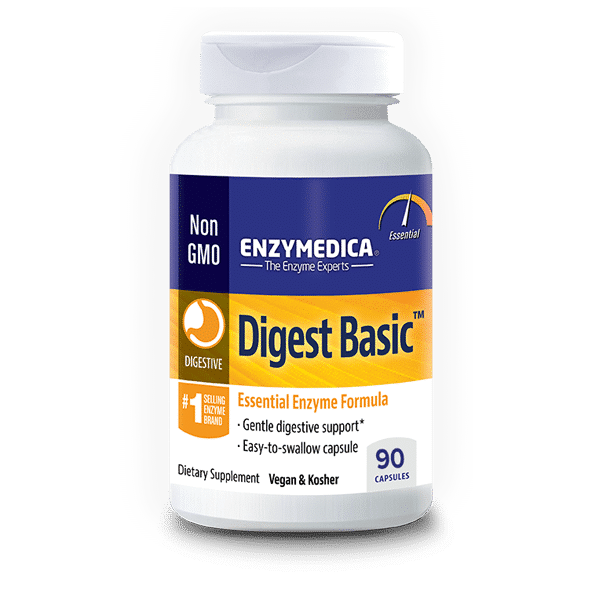 Digest Basic provides enzymes essential for digestion. Using our exclusive Thera-blend process, Digest Basic supports healthy digestion for all major food groups throughout the entire digestive system. Category: Casual. Tags: Digest Basic, Enzymedica. At any age we can benefit from supplemental enzymes that enhance digestion and elimination. Digestive enzymes are critical since they are in charge of breaking down the foods we eat so that the body can more easily absorb them. Moreover, enzymes work specifically on each type of food so that digestion can proceed in an effortless and efficient way. When you eat foods that have no enzyme activity, such as cooked or processed foods, your body needs extra support for digestion. The better we digest our foods, the more nutrients that are available to the body we get. Recommended usage: Take 1 capsule with each meal for enhanced digestion.